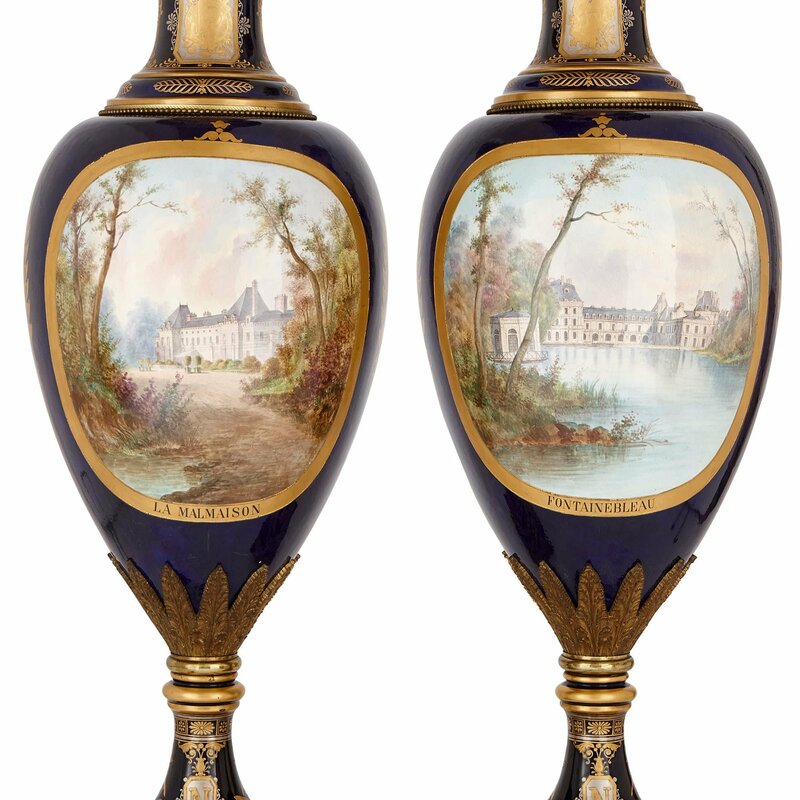 These two Sèvres style porcelain vases are magnificent in their scale and feature exquisite painted scenes, taken from the life of Emperor Napoleon I. The porcelain vases stand on carved walnut wood stands. These rest on shaped square bases, raised up on four bun feet. The stands have scrolling cabriole legs with beaded edges. These legs are linked together, near their base, by a circular band and, at their tops, by an intricately-carved foliage swag. Above, the vases are mounted onto square, ormolu plinths. The corners of the plinths are decorated with lion paws, and their fronts ornamented with Apollo masks, enclosed within diamond profiles. 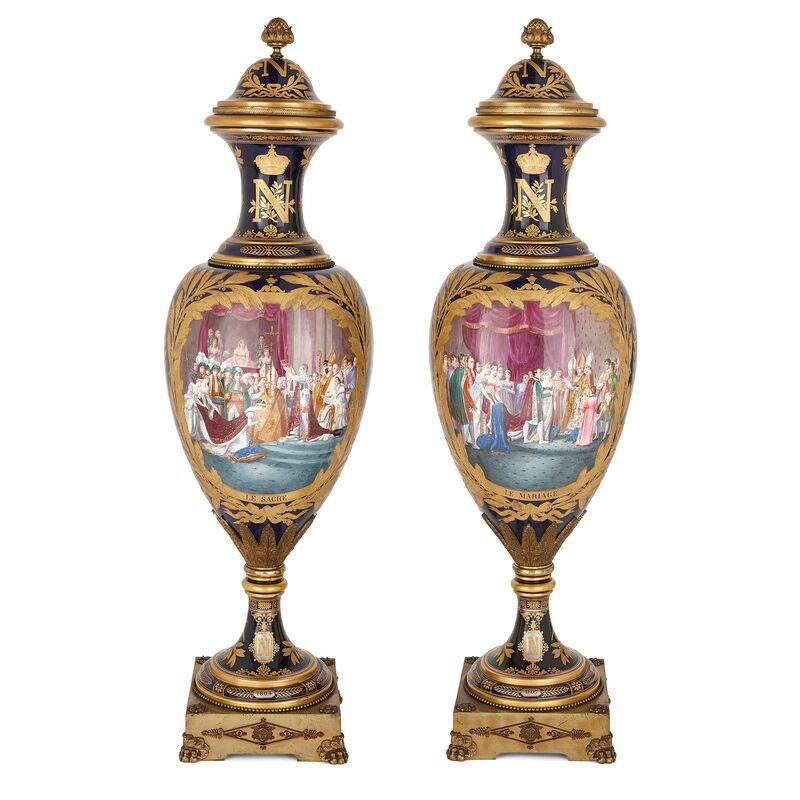 The porcelain vase feet are splayed, and their circular bases edged with ormolu beading. The feet are decorated with various dates, which are bordered by gilt foliage. The dates around the rim of the feet mark important years in Napoleon’s rule, including 1804, when he was coronated Emperor, and 1805, when France defeated the army formed by Austria and Russia at Austerlitz. 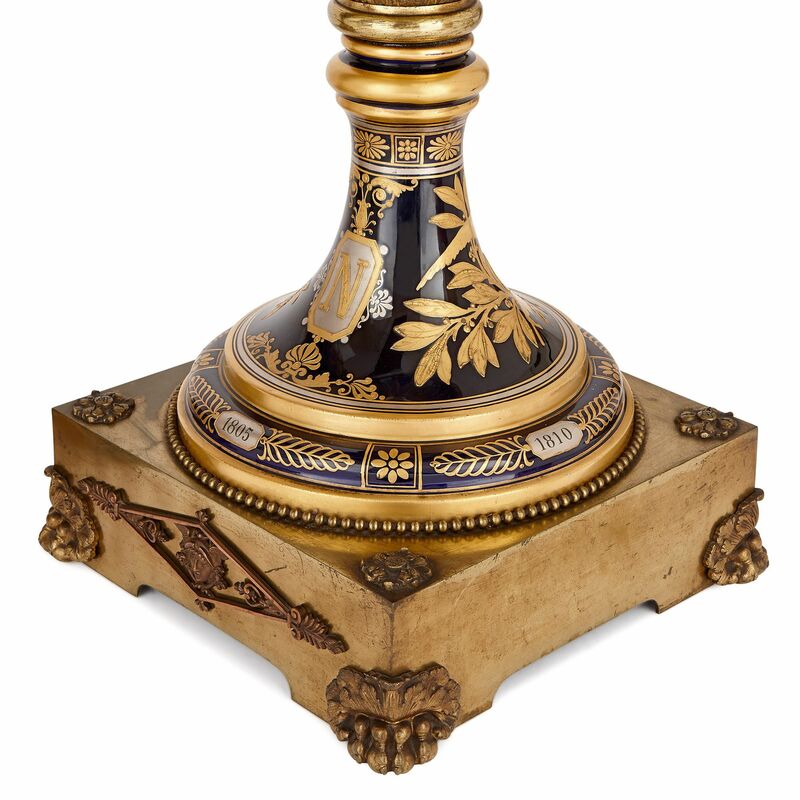 Above, the vase stems feature gilt 'N's, for Napoleon, surrounded by more gilt foliate motifs. All of these gilt designs are set against a navy ground. Ormolu classical leaves decorate the lower part of the ovoid vase bowls. At their centres, these bowls feature large painted panels, which are framed within gilt laurel wreaths, and set against navy grounds. 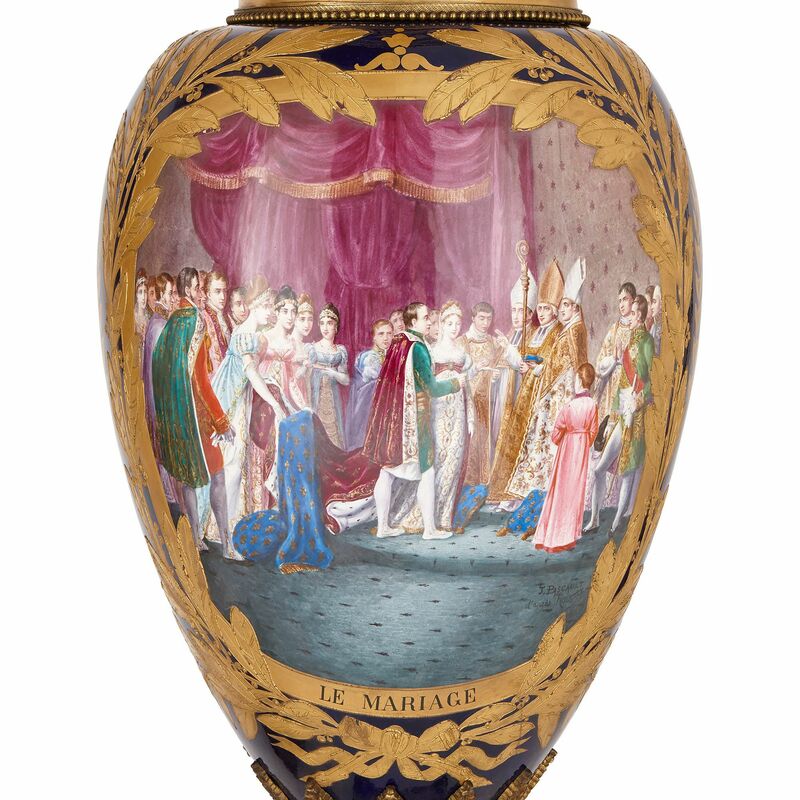 One vase painting depicts 'Le Mariage' (The Marriage), and it is signed, 'J. Pascault d'apres Rouget’. The image was painted by Pascault after the famous painting of the ‘Marriage of Napoleon I and Marie Louise' by George Rouget. This was created in 1810, the year that Napoleon married his second wife, Marie Louise. This scene shows Napoleon I and Marie Louise standing before Cardinal Fesc, who delivers the nuptial blessing. Pascault was an exceptionally skilled artist, who produced a number of porcelain paintings in the manner of the old masters. On the reverse side of the bowl, there is a second painting, which depicts 'Fontainebleau'. Fontainbleau is the great château, located south-east of the centre of Paris, which Napoleon I often frequented. 'Le Sagre' (The Coronation) of Napoleon I is the subject for the second vase painting. This is also signed by the artist 'J. Pascault', only here followed by 'd'apres David'. The scene is based on Jacques-Louis David's well-known painting of the 'The Consecration of the Emperor Napoleon and the Coronation of Empress Joséphine on December 2, 1804', which was painted in 1807. In the image, an already-crowned Napoleon stands with his back to Pope Pius VII and lowers a crown onto Joséphine’s head, who kneels before him. On the other side of the bowl, a painting depicts ‘La Malmaison’ — a château on the west bank of the Seine, west of the centre of Paris, which was the residence of Empress Joséphine. 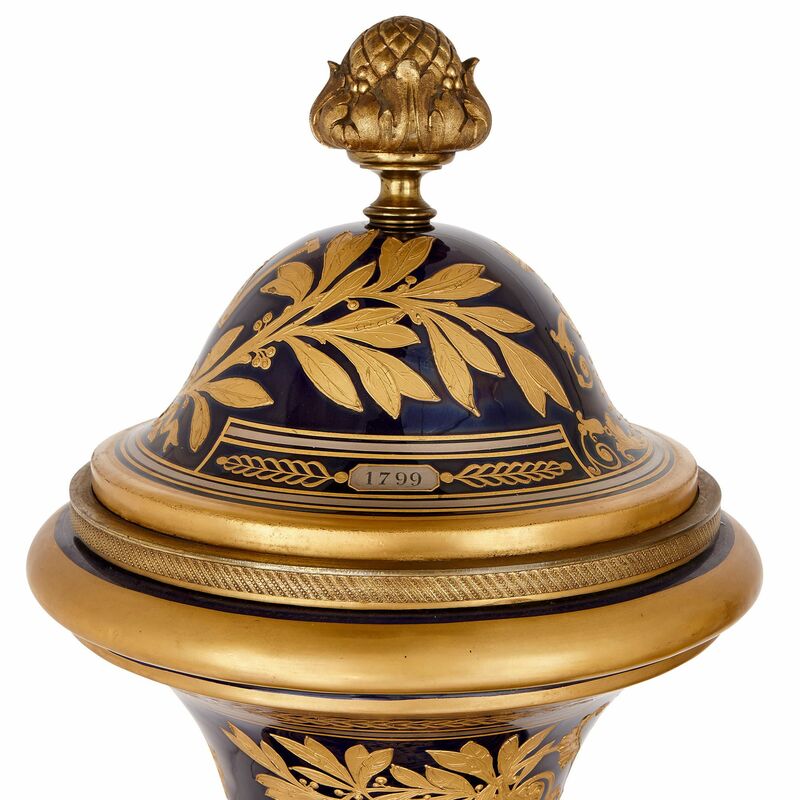 The bowls are topped by slender stems, which feature gilt crowned 'N' emblems for Napoleon I, as well as gilt flowers, set against a navy ground. 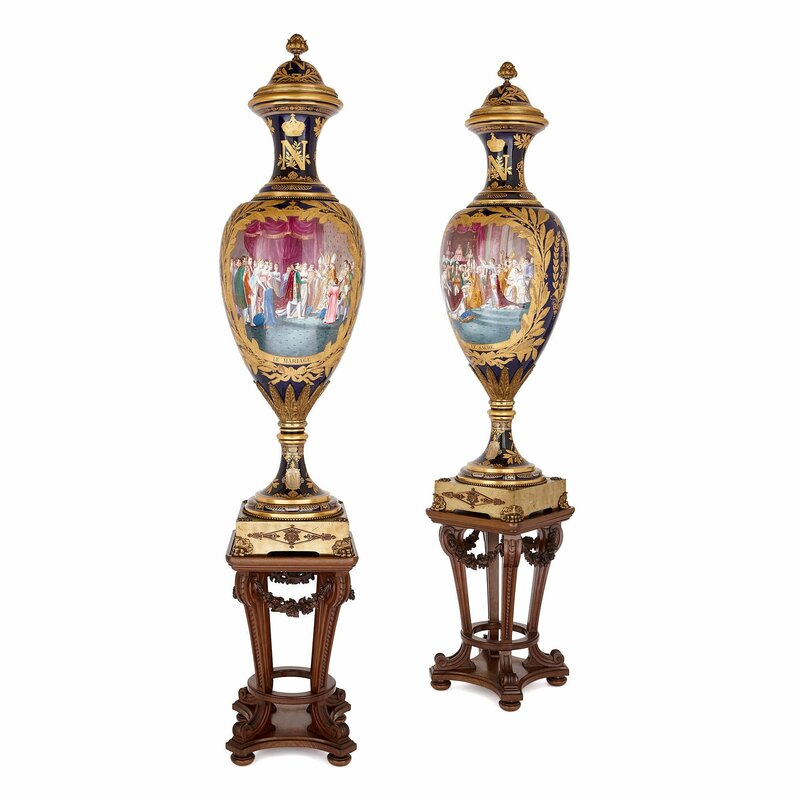 The vase mouths are edged in ormolu, and topped by domed porcelain lids. These are painted and parcel gilt in a similar manner to the necks, and are surmounted by ormolu pinecones. The lids are marked on the inside with, 'M. 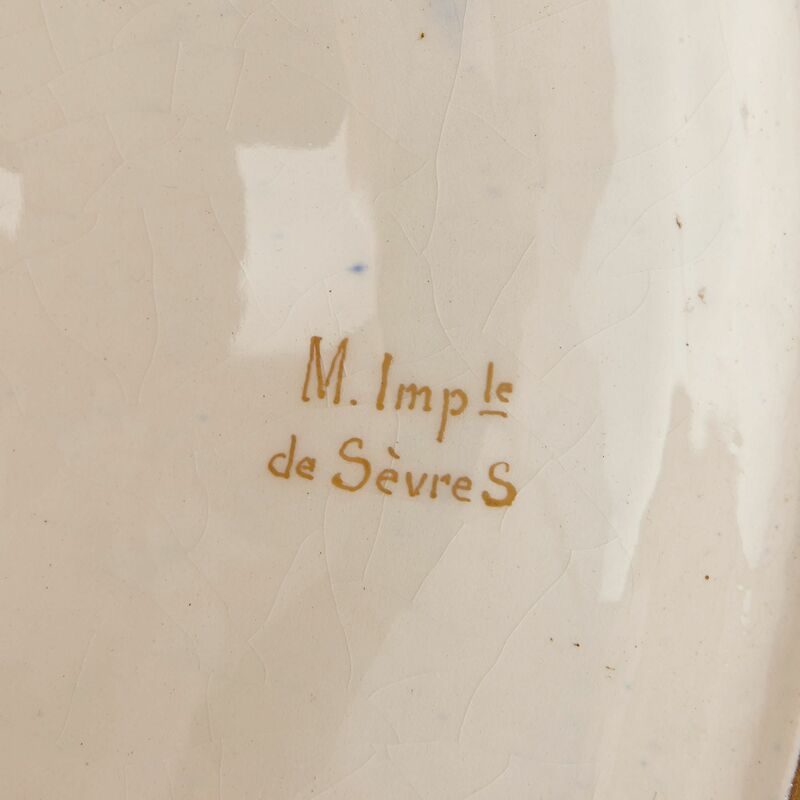 Imple / de Sevres'. From the former collection of a member of the Belgian Royal family. Sold through the Société Luxembourgeoise in an auction titled 'Les Encheres du Grand-Duche', which was held on 14 December 1955 (lots 92 and lot 93).